Two essays within larger publications have caught my eye as 2019 gets underway. The first is special – a substantial catalogue for the AGNSW show of Tony Tuckson's abstract expressionism has gone further than is the norm, taking us into Tuckson's Gallery curation career and then into the factors that built his reputation for having introduced Aboriginal art as art into the Sydney gallery way back in the 1950s. Then there's the unabashedly 'Transcontinental project' to share the Aussie-born, Latvian-descended artist Imants Tillers with his parents' homeland in a bilingual Power Publication, 'Journey to Nowhere' which includes an essay by surely the busiest academic today considering Indigenous art issues – Ian McLean (now Hugh Ramsey Chair of Australian Art History at the University of Melbourne) – under the mystifying title, 'The Metaphysics of Mimicry : Why Imants Tillers Appropriates Aboriginal Art'. Let's take the easy option first! Cara Pinchbeck, Senior Curator of Aboriginal & Torres Strait Islander Art at AGNSW, hints at a surreptitious motive behind her deep researches into the Gallery's archives, which is to somewhat diminish the legend of Tuckson as Collector Hero and boost the agency of the artists in both Arnhemland and on the Tiwi Islands who created the works that were seen as so revolutionary in the 50s. Proof of their shock of the new down south lies in the quote from Douglas Stewart – art critic and playwright – when the famous Pukumani Poles were first put on “permanent display” in the Old Courts. He suggested that they be tucked away for their own good so as “not to clash with the infinitely more sophisticated works nearby”! But Pinchbeck's real achievement is to emphasise that it was the vital force of Stuart Scougall, the orthopaedic surgeon fascinated by the bone alignment that allowed Aborigines to stand on one leg, which led to the Gallery's collecting. But that had the undoubted encouragement of Director Hal Missingham, who'd bought a Pareroultja work from Hermannsberg as early as 1947, and shown it, as well as accepting a collection of Cloncurry sculptures from Margaret Preston. It was clearly Scougall who commissioned the Poles, shrugging off Tuckson's attempt to limit their numbers – when they cost precisely GBP10 each! And it was Scougall who identified both the 'best sculptors' on Tiwi in Stephen Portaminni and Laurie Mungatopi, and recognised the importance of balancing Dhuwa and Yuritja clans in Yirrkala – favouring (quite correctly) the art of Mungurrawuy Yunupingu and both Wandjuk and Mathaman Marika. But of course, it was Tuckson – along with his wife Margaret and Scougall's secretary Dorothy Bennett – who enthusiastically travelled to the North to both collect and learn. For when the party arrived on Melville Island in 1958, only 3 of the proposed 12 to 16 Poles were actually completed. This forced the southerners to go bush to select trees and ochres, and then return to base to learn how ancestral patterns of carving and painting were chosen for each pole and the appropriate ceremony performed. Cultural context was everything. Tuckson then surprisingly discouraged the Tiwi artists from accompanying their work to Sydney for its revelation. However, he gave Wandjuk Marika hospitality when he visited Sydney. 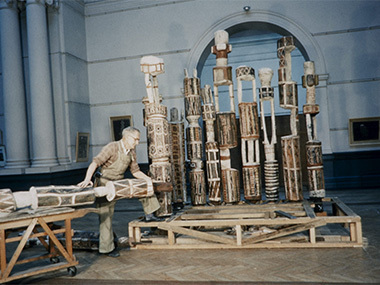 An intriguing suggestion by Pinchbeck is that the accolade of Gallery approval for the Yirrkala artists may have encouraged them to take a more political direction in their art via the 1962 Church Panels and the 1963 Bark Petition to Parliament. Certainly, the funds received for their AGNSW art went into the establishment of a fishing cooperative which took them outside Mission control for the first time. Cara Pinchbeck will be talking about Tony Tuckson and these fascinating connections at the AGNSW on Wednesday 30 Jan at 5.30pm. Ian McLean's arguments are a whole lot more complex and, indeed, tendentious. The facts are that Imants Tillers – the man best known for his assiduous accumulation of more than 100,000 individually numbered canvas boards over many specific paintings all adding up to what he calls his “Book of Power” - borrows images from many other artists in his works. Indeed, most of his paintings involve the appropriation of another artist's work, ranging from Caspar David Friedrich and Hans Heysan to Colin McCahon and Emily Kngwarreye. But, in his essay, apart from the mention of Albert Namatjira borrowings (but not illustrations) McLean concentrates his thoughts on Michael Nelson Jagamara, who first took Tillers' fancy in 1985, though the Warlpiri artist was initially unconsulted about this theft. Subsequently, they appear to have become friends – exchanging some 20 appropriations between Papunya and Cooma, where they respectively live, during the years 2001 and 17 – with the encouragement of Jagamara's dealer in Brisbane, Michael Eather. 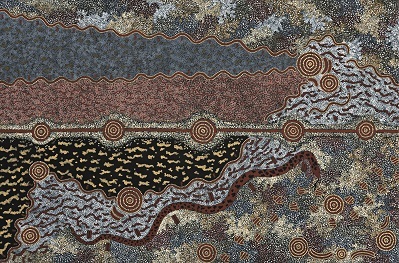 But, since no mention is made of any borrowings from urban Aboriginal artists, and the point is made that Tillers saw “a certain destiny in Aboriginal art” as an answer to the “moral void in Western culture” post World War II, it's really out of whack for McLean to suggest that “for many Aboriginal artists, Western art traditions are as much part of their heritage as Aboriginal traditions”! Surely Tillers was keen to take full advantage of “a post-Western way of being” that was “post-colonial, environmental and Indigenous”. “You gotta canvas, paint and brush ready. Well, first you gotta ask your father and kurdungurlu (the guardian of any story). They'll say 'You do that Dreaming there, which is belonging to your grandfather and father'. They'll show you a drawing on the ground first. You got it in your brain now. You know it because you've seen your father (in a ceremony) with that painting on his body and one on the ground. You'll see it, then you'll know it”. Similarly, McLean discovers that Albert Namatjira was “mimicking the Western modernist landscape tradition” in his watercolours, allowing him to conclude that Tillers and Namatjira were “both entwining their mimicry with their broader philosophical stories”! But then McLean appears to believe without irony that the Red Heart of Australia where Tillers' Aboriginal artists all come from is on the Australian periphery – rather than being at the core of their being. Papunya, ironically, is identified as the closest community to Australia's “continental pole of inaccessibility” - ie its furthest point from a sea, and therefore, I suppose peripheral only to coastal Oz. As the Irishman replied, when asked for directions to somewhere, “Aw, I wouldn't start from here”! There's rather more insight into Tillers when McLean turns to the artist's European sources in Mallarme, Duchamp and Christo – with whom the 19-year old Tillers laboured to wrap Little Bay in 1969 – though it's the first time I've ever made the jump from Christo's 'Wrapped Coast' to the Duchampian notion that the artist was seeing Australia itself as a readymade like the infamous urinal! Some comfort in all this may be found in quotations from a book called 'Art: The Whole Story' from 2010. 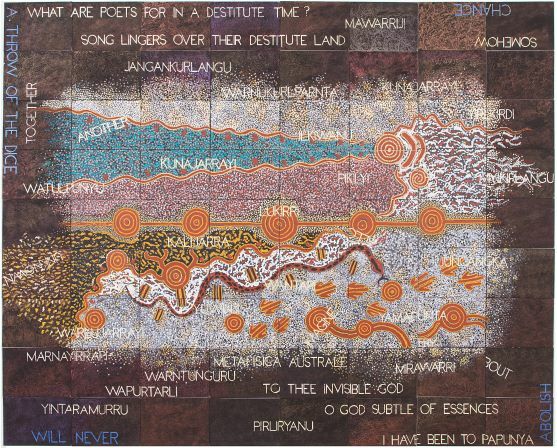 It would seem that Papunya's Aboriginal art is the only contribution from Australia in the history of the world's art between 75,000BC and today, and Michael Nelson's 'Five Dreamings' is featured and analysed as the subject of appropriation. Wow! But I think I'd be more confident in this magnificent judgement if the chapter in question hadn't also been written by Prof McLean.